Researchers at Korea’s Advanced Institute of Science and Technology (KAIST) have developed a new type of aqueous energy storage device that they claim can be charged in less than half a minute. Schematic diagram for aqueous hybrid capacitors. Employing aqueous electrolytes instead of flammable organic solvents, the device is claimed to enable a boosting charge with high energy density, potentially making it suitable for a range of portable electronic devices. 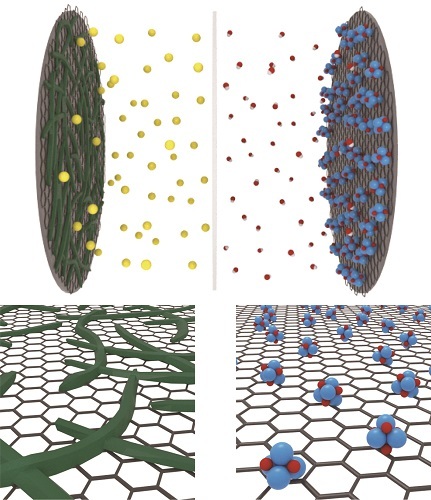 According to the group, which was headed up by Prof Jeung Ku Kang from the Graduate School of Energy, Environment, Water, and Sustainability the system owes its performance to a design that assembles fibre-like polymer chain anodes and sub-nanoscale metal oxide cathodes on graphene. The device can be charged within 20 to 30 seconds using a low-power charging system, such as a USB switching charger or a flexible photovoltaic cell.